In 2013, the Bugatti Veyron 16.4 Grand Sport Vitesse became the title holder as the world’s fastest open-top production sports car. It was driven by Chinese racing driver Anthony Liu at the Ehra-Lessien with a speed at about 254.04 mph. Even at such a high speed, Liu claims that the Vitesse was “incredibly comfortable and stable” without being compromised by the wind at such a high speed. However, on the 11th of April 2016, the title of being the world’s fastest open-top production sports car was snatched from the Bugatti Veyron 16.4 Grand Sport Vitesse. The Hennessey Venom GT Spyder hit a speed of 265.60 mph during its run at California’s Naval Air Station Lemoore beating Veyron’s 254.04 mph. The Bugatti Vitesse came at around 11 mph short. Dang! Anyway, a Racelogic VBOX was used to record the GT Spyder’s speed. Here’s some refresher for those who have forgotten how awesome this new world record holder is and for those who have absolutely no idea of the power of the Hennessey Venom GT Spyder. In Autumn of 2011, Aerosmith lead singer Steven Tyler approached Hennessey and requested an open-top version of the Venom GT. Incredibly, Hennessey yielded to the request and made structural changes including an additional 30 pounds to the Venom GT’s curb weight. There were five 2013 model year cars delivered including Tyler’s. The Hennessey Venom GT Spyder is powered by a 7.0-liter Hennessey-built twin-turbo V8 engine and is capable of producing 1,244 horsepower and 1,155 lb.-ft. of torque at 4,400 rpm. It can sprint from 0 to 60 mph in 2.7 seconds and cover a quarter-mile in 9.92 seconds. To top it off, the GT Spyder has a top speed of about 278 mph. Two years ago, Hennessey Venom GT was the title holder as the fastest convertible with a speed of 270.49 mph, about 2 seconds faster than its then rival the Bugatti Veyron Super Sport. And Hennessey has once again stolen the title from Bugatti plus broken its own record thanks to the Hennessey Venom GT Spyder. The world's fastest convertible is officially from Texas. 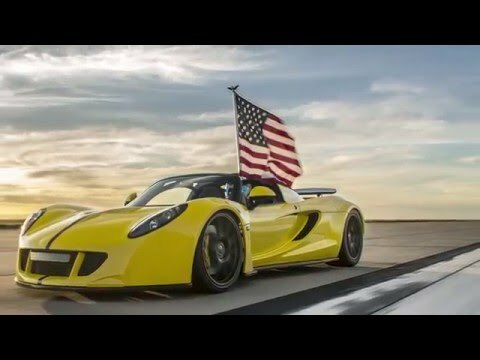 On March 25, 2016 the Hennessey Venom GT Spyder has set a new world record for open-top sports cars at Naval Air Station Lemoore where Racelogic, the renowned independent speed testing firm, has officially confirmed that a top speed of 265.6 mph was achieved. The record run was certified by Racelogic technical director, Jim Lau, and witnessed by Commander Darren Fouts, Air Operations Officer. The Venom GT roadster was driven by Brian Smith, director of the Ford Performance Racing School. Following the spectacular record-breaking speed of the Hennessey Venom GT in 2014, during which the hardtop coupe achieved a top speed of 270.4 mph (435.3 km/h) at the Kennedy Space Center, a record speed that remains unparalleled to this day, Hennessey has added yet another milestone. The open top version, the Venom GT Spyder, now also officially holds the world record. The open-top super sports car reached a maximum speed of 265.6 mph (427.4 km/h) at the US Navy's 2.9 mile long runway in Lemoore, California, making it the fastest convertible sports car in the world – beating the previous record held by the Bugatti Veyron Super Sport Vitesse by over 11 mph. "2016 marks the 25th anniversary of Hennessey Performance", said company founder, John Hennessey. "I thought that this would be a special way to celebrate 25 years of making fast cars faster. I've wanted to test the top speed of our Venom GT Spyder, without the roof, ever since our coupe ran 270.4 mph on the Space Shuttle landing runway at NASA's Kennedy Space Center in 2014. This was a great way to validate the technical excellence of our car which includes high-speed stability with an open roof." Hennessey plans to offer a limited run of 3 "World Record Edition" Venom GT Spyder's to commemorate the record run and as a tribute to the company's 25th Anniversary. The cost is $1.3 million each plus tax. "We are grateful to have the help of so many friends, family, employees, customers and partners over the past 25 years. We look forward to the next chapter of the Venom with the F5 as we keep making fast cars faster for the next 25 years", said John Hennessey.